MOFA: Speech by Mr. Hirofumi Nakasone, Minister for Foreign Affairs of Japan At the Plenary Session 1 of the First TICAD Ministerial Follow-up Meeting: "Progress status of implementation of Yokohama Action Plan and future challenges"
Top > Regional Affairs > Africa > TICAD > TICAD IV > TICAD Ministerial Follow-up Meeting > Speech by Mr. Hirofumi Nakasone, Minister for Foreign Affairs of Japan At the Plenary Session 1 of the First TICAD Ministerial Follow-up Meeting: "Progress status of implementation of Yokohama Action Plan and future challenges"
It was May of last year that TICAD IV was held and the Yokohama Declaration and the Yokohama Action Plan were announced. A few months later, the world was beset by a financial and economic crisis said to occur once in a century. The international community is currently engaged in all-out efforts to overcome this crisis. The week after next, the second Summit on Financial Markets and the World Economy will be convened in London. Amidst such developments, we have come together here at Gaborone to undertake follow-up on TICAD IV. First of all today, as one of this meeting's co-chairs, I would like to provide a general overview of the status of implementation of the Yokohama Action Plan thus far. On that basis, I would then like to share my thoughts on how the countries of Africa and development partners who share the TICAD spirit should advance their cooperation amidst this crisis. With regard to the impact of the global financial and economic crisis on Africa, what is now of the greatest concern is that there is a possibility that Africa will be profoundly affected by this crisis and that its economy, which has attained such striking growth in recent years, will suffer a slowdown while achievement of the Millennium Development Goals (MDGs) is dramatically delayed. This would mean that the efforts of the development partners and the countries of Africa would come to naught, so this must be avoided at all costs. The Annual Progress Report 2008 that you have in front summarizes the status of implementation of the Yokohama Action Plan over the approximately nine months since TICAD IV was convened. Even though the financial and economic crisis has dramatically shaken the economies of development partner countries, progress has been seen in a large number of fields. I am firmly convinced that the first year of the follow-up constitutes a very positive start. To begin with, I would like to speak about the area of boosting economic growth, which is the first pillar of TICAD IV. First, missions constituted by a total of 180 participants from both private sector and the government visited twelve African countries in order to promote trade and investment with Africa, and an independent report has been compiled that incorporates their recommendations on measures to be taken. 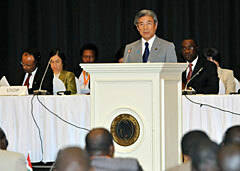 The Japanese government also held a symposium in this regard in Tokyo to which six African countries were invited. In addition, we are planning to dispatch additional missions this year. Moreover, in the field of tourism, a seminar is scheduled to be held in Uganda in June this year under the framework of the Africa-Asia Business Forum (AABF). Second, in order to double Japanese private investment in Africa by 2012, financial assistance on a scale of 2.5 billion US dollars was pledged at TICAD IV, and the Japan Bank for International Cooperation (JBIC) has already authorized a total of 740 million dollars for the promotion of investment and its environment by Japanese companies. Third, 300 million US dollars in soft loans have already been extended to the African Development Bank (AfDB), thereby providing a facility that can be utilized by the African private sector, which is facing cash flow problems. Fourth, 70% of the poor in sub-Saharan Africa are dependent on agriculture for their livelihood. The Coalition for African Rice Development (CARD), which plays a role in promoting agriculture by aiming to double rice production output over the next ten years, has already commenced steady activities. Fifth, with regard to developing regional transport and power infrastructure, as an example, Japan has already made commitment for projects amounting equivalent to approximately 36% of the total amount of assistance that we announced to provide over the next five years in the form of grant aid and technical cooperation. Next, I will address progress in areas of achieving the MDGs, which is the second pillar of TICAD IV, and the consolidation of peace, the third pillar. A large number of projects have been launched in order to support these extremely important goals for ensuring human security. While I will not touch on them in any detail in my remarks today, roughly half of the 25-page Progress Status List is comprised of progress made in these two areas. Looking now at progress in environmental issues and climate change, the fourth pillar of TICAD IV, I would like to talk about the Cool Earth Partnership. This is a Japanese initiative to assist developing countries that aim to contribute to the stabilization of the climate by working to achieve both greenhouse gas emissions reductions and economic growth in a compatible way. I am pleased that 27 African nations -more than half of the countries on the African continent- have become Cool Earth partners. In the TICAD process, emphasis is placed on South-South cooperation, particularly on enhancing the promotion of Asia-Africa cooperation. During these nine months, efforts have been underway to expand new partnerships, such as cooperation between African countries and emerging donors and collaboration with civil society and the private sector. The fact that we have private sector and NGO representatives from both Japan and Africa participating as speakers at this meeting is also evidence of this. Because the Yokohama Action Plan was originally formulated aiming "towards a Vibrant Africa," having looked at progress thus far, it causes us to realize once again that this Action Plan provides us with an effective prescription, even when faced with the new situation like the current global financial and economic crisis. 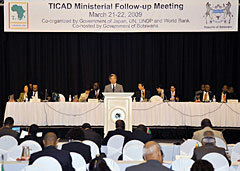 At TICAD IV, Japan announced that it would double its ODA for Africa by 2012 and that it would assist in doubling Japanese private investment there by then. Among my African colleagues there may be some who are worried whether these pledges will be honored, as Japan is also heavily impacted by this crisis. However, taking this opportunity, I would like to state once again that Japan is determined to carry out its commitments made at TICAD IV without fail. In particular, I would like to confirm once more that Japan will indeed be providing up to 4 billion US dollars in concessional loans to Africa over the five year period. The global financial and economic crisis that has arisen since this past autumn can be expected to impact the countries of Africa for at least two years to come. With this in mind, in this period of crisis, we will actively mobilize the consessional loans that I just mentioned, while expediting the implementation as early as possible of 2 billion US dollars of grant and technical assistance, in order to steadily carry out our commitments. By doing so, we will be able to advance economic growth in the fields of infrastructure development, human resource development, and agriculture with greater impact. With a view to the attainment of the MDGs, Japan will more strongly support the efforts of African countries in such areas as community development, education, health, and water and sanitation, while also further scaling up and reinforcing our assistance in the field of the environment in order to realize sustainable development. Japan intends to intensively conduct more than one hundred preparatory surveys by the first half of this year so as to concretize and realize these assistance measures. Japan will also undertake assistance that addresses more directly the impacts of the financial and economic crisis on Africa. For example, this March, Japan provided to Africa food and humanitarian related assistance of approximately 300 million US dollars, recognizing that the socially vulnerable people are the ones who will be most severely impacted as this crisis expands. In addition, as countermeasures to infectious diseases, next week Japan will be disbursing approximately 200 million US dollars to the Global Fund to Fight AIDS, Tuberculosis and Malaria, of which Africa is a major beneficiary. Furthermore, Japan has made available such measures as up to 100 billion US dollars equivalent lending to the International Monetary Fund (IMF) and 3 billion US dollars Bank Recapitalization Fund initiated by International Finance Corporation (IFC) and Japan Bank for International Corporation (JBIC), and African countries are welcome to utilize these. Japan will also provide assistance for human resource development in the finance sector in order to reinforce Africa's financial systems and so on. Until now I have been speaking of what Japan stands ready to do. And yet, TICAD is not a conference at which development partners unilaterally make pledges and commitments. The basic principle of the TICAD process, and, indeed, a principle now held in common by the international community, is for the international community to support, as partners, Africa's self-help efforts-that is, "ownership" by Africa itself. Swift and close cooperation by African countries is critical for carrying out the commitments made at TICAD IV efficiently and effectively. There are concerns that public revenues, foreign direct investment, private capital inflows, and remittances from abroad will all decrease henceforth, as repercussions of the financial and economic crisis. It goes without saying that the efforts of my African colleagues present here, will be indispensable in order not to decrease these and to use development resources in the most effective way. I strongly hope that all African countries will take the initiative in undertaking necessary measures, such as prioritizing allocations of resource to push national development policies forward and identifying appropriate projects that contribute to growth, thereby engaging in "ownership" to the greatest possible extent. At this juncture, I emphatically call upon other development partner countries and organizations, not to reduce their assistance to Africa, but instead to be engaged even more proactively than before, with the same determination being shown by Japan. I would like to propose to send out a message to the London Summit at the end of this Meeting, based on the discussions over the next two days. Prime Minister Aso intends to take this message to the Summit and, along with the representatives from Africa, reflect the "voices of Africa" in the discussions of the heads of state and government. I would like to close my remarks today with my sincere hope that at this meeting that we are about to begin, valuable and constructive discussions take place and a robust message is sent out.